Three Rivers Market is committed to creating and nourishing a healthier environment, healthier people, and a healthier community. Our local and cooperative economy is ethical, sustainable, and strong. Our community has access to healthy food. Our natural world is respected, protected, and restored. One of the ways we realize our goal is by creating opportunities for our customers to contribute to their community in positive ways. 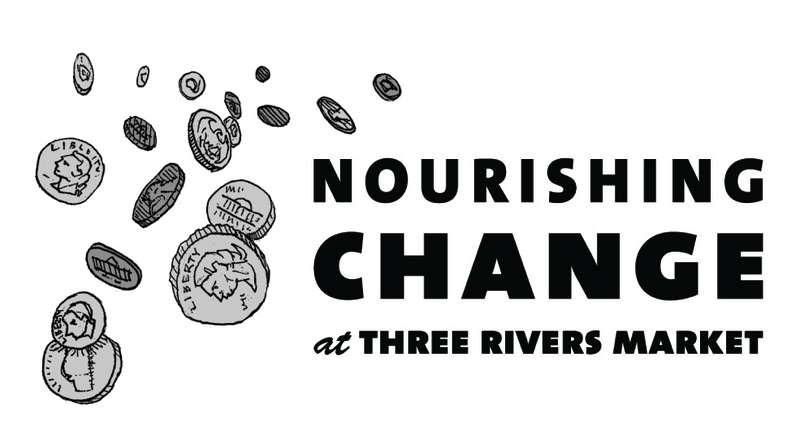 The Nourishing Change Program does this by facilitating donations at the register to organizations that are also committed to creating and nourishing a healthier environment, healthier people, and a healthier community. Are nonpartisan and do not advocate a particular religious belief. Are located in the communities served by Three Rivers Market in Knox, Blount, Anderson, and Sevier counties. Operate with an annual budget under $1,000,000 and will be significantly impacted by the donation amount collected. A calendar of rotating monthly recipients is established biannually, and all donations made during the month will go to the designated recipient. The recipient organization will be a food pantry four months each year. At Three Rivers Market’s discretion, the recipient calendar may be preempted to raise emergency or disaster relief funds. Please complete the recipient application and return it to our Customer Service Desk. We review applications in June and December. Applications submitted between January 1st and May 31st will be reviewed in June for July – December recipients the same year. Notifications are made for this round by July 31st. Applications submitted between July 1st and November 30th will be reviewed in December for January – June recipients the following year. Notification are made for this round by December 31st.